Now 24 and owner of four more Cup victories, including two this season, Logano goes into Sunday’s Camping World RV Sales 301 as one of the favorites, along with Penske Racing teammate Brad Keselowski. But the oval he considers his home track since he was brought up in Middletown, CT., about 160 miles away, has not been kind to Logano this week. The youngster crashed hard Friday after a tire went down and had to move to a backup car for qualifying. Still, he managed to put his No. 22 Ford into the sixth spot in the 43-car race field. 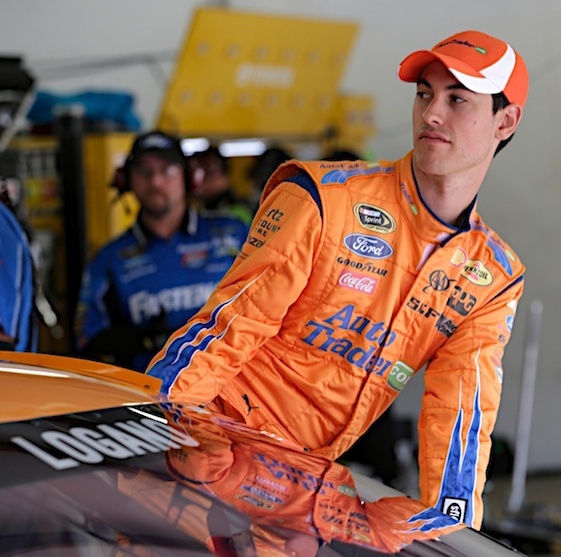 Logano came away from the hard hit on Friday with a sore left wrist. It got so sore overnight that he had to have it taped Saturday morning. But that didn’t stop him from running seventh in the final practice session. Logano goes into Sunday’s race sixth in the standings and a good day will clinch a spot in the Chase for the championship for the second straight year. Asked if that is on his mind, Logano said, “We kind of figured we were in with the two wins anyway, so it doesn’t really change much for us. We’ve been racing hard and racing for wins. Keselowski has also won twice this season, but Logano believes that the whole Penske team still has work to do to continue to figure out the new cars and be totally ready for the Chase. Each team is allowed only four tests on Sprint Cup tracks, but Logano and Keselowski have been testing extensively at tracks that are not part of NASCAR’s top series. “We’ve save the (official) tests for the end (of the regular season) because the cars are evolving so quickly. If you test now, it may not be relevant by the time the Chase starts. That’s how much they are changing,’’ he noted. Keselowski has already given Penske a Cup title (in 2012) and Logano said he thinks one of the teams drivers can win the championship in 2014. Kyle Busch will start from the pole, with six-time Cup champion Jimmie Johnson on the outside of the front row, followed by Denny Hamlin, three-time champ Tony Stewart, Jamie McMurray, Logano and Keselowski.